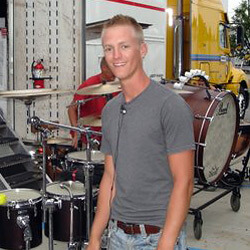 Brandon Runyon, 21 University of Illinois at Urbana-Champaign; undergraduate in percussion performance Santa Clara Vanguard Front Ensemble, 2009 How did you choose your corps? I had wanted to perform with a drum corps for a number of years but never had the proper motivation. By chance, one of my colleagues has been a front ensemble instructor with SCV the last two summers and was recruiting people from our percussion studio at school to go out and audition. I finally found the motivation and support I needed and went for it. In your experience, what's the best way to prepare for an audition? It's simple; be prepared. The audition material needs to be internalized to a point where it becomes second nature to you. This is even more true during the drum corps audition process. Where most other auditions like those for band or orchestra require you to simply play your material without interjection from the proctors, the drum corps audition is a very interactive process. You need to be able to play the material and be comfortable enough with it to make adjustments on the spot as requested by the staff. Your ability to adapt and be flexible will procure the right kind of attention from the staff and reflect positively on both your preparedness and your overall capabilities as a musician. What can a prospective corps member expect when he/she shows up for an audition weekend? Again, be ready to make adjustments. Every ensemble has its own approach to technique and musicality. The way you've been taught previously may not line up with the corps' style and staff members may require you to adjust. Stay open-minded and be ready to fine tune your playing according to their standards. The first time you auditioned, was the process different from what you expected it to be? I didn't really have any preconceptions about the process so it just was what it was. The days were long and we played a whole lot and that was about it. The staff only has a limited amount of time with you throughout an audition weekend so you have to be prepared to play a lot. It's the only way they can gauge your level of proficiency in such a short amount of time. Were you nervous at your audition? Absolutely, I was nervous. Nerves are inevitable and if someone tells you they're not nervous about auditioning or performing, they're probably lying. Overcoming nerves is all about having confidence. By the time of the audition, you've spent a lot of time preparing the material and all you can do is focus and play to the best of your abilities. Fortunately, the audition evolves over an entire weekend. Because of this, there is time to really settle into your surroundings and get comfortable working with the staff and the other people auditioning with you. What do you think is most important for someone to take away from the audition experience? Regardless of whether or not the audition is successful and you are asked to return, the weekend is an opportunity to perform and learn. You get to spend several days with world-class teachers and performers, so be excited for the opportunity to learn from them and further your own abilities. Any other advice? Everyone at the audition camp will vary greatly in skill level. Understand your strengths and work with them. Don't be timid to really put yourself out there. The ultimate goal of the corps is to put together a riveting performance and your personality needs to reflect the excitement and grandeur of a drum corps show. Learn more about corps audition dates, locations and additional info.